and Destiny 2 systems at launch. I've been playing at about one hour with the new weapon system, so I have only a preliminary idea of ​​how it works. It's a lot of fun in a few obvious ways, though it's hard to get lost first. It is both more flexible than the weapon system of the first year, and more unexpectedly limiting. If you have never played Destiny it will probably make sense. But if you played [Destiny it's a lot more confusing because you have to unlearn to unlearn things that you've internalized for years. This is now a special weapon, and it sits in the energy slot. In the first Destiny you had your primary cannons, your special pistols and your heavy pistols. Primaries were rifles such as hand cannons, pulse rifles and car rifles. Special weapons were stronger weapons such as shotguns, sniper rifles and fusion rifles. Heavies were the most powerful of them all, like rocket launchers, swords and linear fusion rifles. Each weapon has either kinetic damage or energy damage (you know: fire, lightning, or purple); Weapons that caused energy damage were more specialized and useful against certain types of enemy shields. Most primary weapons caused kinetic damage and all special and heavy weapons damaged energy. You would get something like a sun shotgun or a rocket launcher. Bungie overtook this system for the first year Destiny 2 . There were still three slots, but they worked completely different. Instead of primary / special / heavy, the guns were now broken down into kinetic energy / energy according to their ammunition. 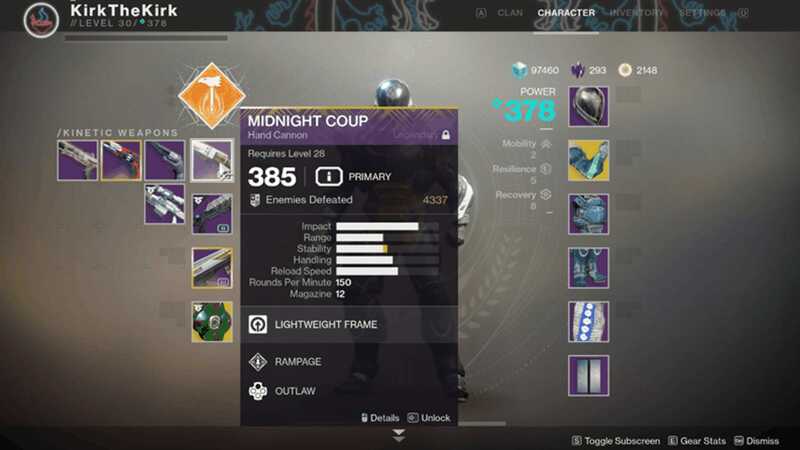 Kinetics and energy weapons were all weapons that used to be considered "primary" weapons, while the more powerful weapons, including former special weapons such as shotguns, sniper rifles, and fusion rifles, were now collected under the "Power" slot. Many players hated this change as it reduced the number of powerful weapons a player could equip at a time. In the first game you could equip a shotgun and a rocket launcher, but in the sequel you had to choose one or the other. The new system introduced in today's patch is a hybrid of these two predecessors. Weapons are still categorized according to the nature of their damage (kinetics, energy, power), but this categorization has been decoupled from the type of ammunition they take. Quite straightforward, right? The next thing you can imagine is the ammunition that still appears in the game as white, green or purple pickups. White ammo tiles go to primary rifles like hand cannons and automatic rifles. Green ammunition tiles are less common and are used for special weapons such as sniper rifles and shotguns. Purple heavy bricks are the rarest and you use them for heavy weapons like rocket launchers and swords. That seems to be fairly easy as well. It's going to be weird here, at least for long Destiny players. You still have three weapon slots, which means you can equip three weapons at the same time. In your inventory, your weapons are now not organized by type of ammunition (primary / special / heavy), but by their damage type: kinetic / energy / force. This means that all kinetic weapons, including special weapons, can only be equipped in their first "kinetic" slot. All energy pistols, including primary and special energy pistols, must go into your second "power" slot. Powerweapons do elemental damage, take heavy ammo, and all sit in your "power" slot. I'll still have a weapon for it All Ammo Type – Polaris Lance Takes Primary Ammo & Hawthorne & # 39; s shotgun needs special ammunition – but they will be in a different order. In practice, it's more or less the same as the first loadout except I have to internalize that a single tap of the weapon exchange key will bring me my special weapon while double tapping on my primary weapon. That's the opposite of how it has always worked in the past, and one of those muscle-memory things that will be hard to unlearn. I would put a kinetic shotgun (Hawthorne) in the kinetic slot, one Energy shotgun (Ikelos) must be in the energy slot and a heavy shotgun – shotgun in the energy slot. Legend of Acrius is one of two heavy shotguns in the game, so I have to call. Using this charge would mean that my two best shotguns would share my special munitions reserves while the legend of Acrius would use heavy ammunition. I would not have anything with primary ammo, so it would be an unbalanced load. It's hard to say how well the new system works if you choose and play a loadout, even though my first impressions are positive. Despite the fact that it feels like one weapon system is being rigged on another (because it is), it seems a clear change for the better. In PvE, it's super fun to be back when a Titan with hand cannon and shotgun leaps into battle, like the glory days of the first Destiny. I jumped into the Escalation Protocol with Randoms on Mars, and we came to the seventh and final stages, which I attribute, at least in part, to the fact that they all bore much heavier firepower than they did today. It felt liberating to use a high-performance weapon like a shotgun as free as I, without constantly hoping for rare purple ammunition drops. I also played a quick round in the jar, which was enough to make Crucible clear so wild that it is currently impossible to know how everything will spill out. People were sure to be shotgunning and sniping as it was in 2015 again. Whether this is a good or a bad thing, I can not say yet. It will take some time to get used to the new system, especially as Destiny 2 is about to go through Further changes next week when Forsaken actually hits. For now I go back to the crucible and enjoy my freshly cleaned shoulder load.